Weighty Matters: Why are there less "fit and fat" folks than there used to be? Why are there less "fit and fat" folks than there used to be? That was the question that leaped to mind after looking at one of the appendices of the recent Edmonton Obesity Staging System paper in the CMAJ. 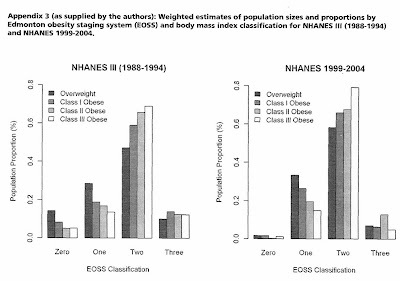 Looking at the graphic up above (if you click it, it'll get larger), it would appear that the earlier NHANES III cohort (1988-1994) included a significantly higher percentage of so-called, "fit and fat" folks, as compared with the later NHANES 1999-2004 cohort. In the later cohort, the percentage of the study population with an EOSS score of zero (meaning folks with overweight and obesity and no medical or life related co-morbidity) was pretty much zero, whereas in the earlier cohort it would appear that over 15% of overweight folks had an EOSS score of zero, as did just under 10% of folks whose BMIs ranged between 30 and 35 and just over 5% of folks whose BMIs were greater than 35. Now I'm far from a statistician, but certainly were than any stats savvy folks reading this post, I'd be very curious to know if that differences up above were statistically significant. Given the size of the cohorts and the dramatic differences seen, I'd be surprised if they weren't. In terms of what's going on? According to Obesity Panacea's Travis Saunders', one possibility is that the distribution of our weight is changing, and that where we're carrying it is the problem, with increasing abdominal distribution weight-independently increasing our risks of developing a constellation of different chronic diseases. Travis forwarded me a paper written by Ian Janssen, Margot Shields, Cora L. Craig and Mark S. Tremblay that looked at differences in waist circumferences and 5 skinfold thicknesses for given weights between 1981 and 2009. What they found was that for any given weight, waist circumferences were higher, as were skinfold thickness values. "These findings suggest that even in the absence of a change in population obesity prevalence as determined by BMI, the population health consequences of obesity seem likely to increase more than anticipated"
Given the impact of exercise on distribution of body weight, this definitely lends ammunition to ongoing exercise promotion efforts, and combining that impact along with the results of the second EOSS paper, the one that suggests lifestyle dramatically attenuates EOSS staged risk, and together they would suggest that exercise promotion should take obesity treatment out of the rationale for exercise, and instead focus on exercise/health at any size. To suss things out further, I'd love to see which weight related co-morbidities increased in the later years cohort - certainly knowing which co-morbidities are on the rise, would help in understanding what exactly's going on. So whether it's increased abdominal distribution of weight or not, it would certainly seem that there's something else out there, something other than absolute weight, that's increasing morbidity in the population with overweight and obesity. My recommendation is that we redouble our efforts to figure out what that something else is and work on it, as I'm guessing we'll have more luck treating it, than we do treating weight.